This is an antsy time of year for most of us Jeep owners. Having spent months cooped up and unable to ride because of the cold weather, the anticipation of getting out and riding again with the top down is almost too much to bear. Now that Spring has sprung and most of the country seems to be emerging from the doldrums of winter, there’s no better time than the present to start tuning up your ride so it’s ready to go when the weather gets warm. #1 – Wash the underbody. While this is a necessity after any muddy ride, washing the underbody of your Jeep after a period of inactivity or after months of traveling on winter roads is also essential in order to maintain a well-running vehicle. Take the time now to clean out grime or road salt that may have accumulated during the winter months. This will not only make your Jeep parts run better, it can stave off possible erosion and potentially save you money on parts replacement down the road. If possible, get your Jeep up on a lift so you can really give the undercarriage a thorough cleaning. I did this with my CJ-7, and I was amazed by how many hidden pockets of dirt I found. 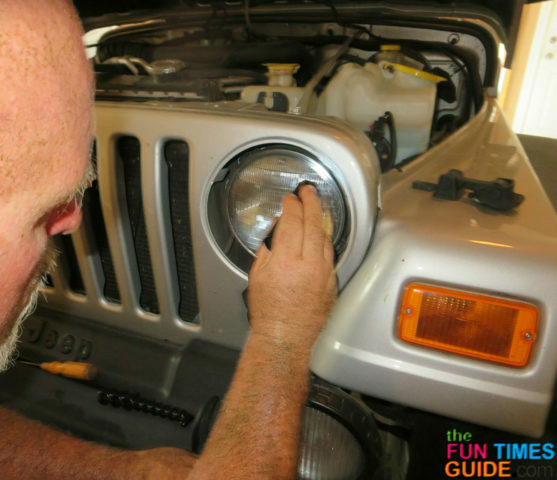 #2 – Clean the headlamps. As a Jeep owner, you’re well aware that your headlights are your saving grace during dusk or dark rides. Not only that, but they are an important safety feature whenever you’re off-roading. That’s why it’s important to pay extra attention to the headlights on your Jeep. Scrub them using a gentle, but powerful glass cleaner or one of these household products — so they’re not cloudy when you set out to ride. Be sure to take the time to clean your rear brake lights as well — so they’ll be clear and visible to other riders. The old adage “an ounce of prevention is worth a pound of cure” definitely rings true when it comes to your headlamps and safety. #3 – Replace any worn parts. Winter weather translates to vastly different experiences for Jeep owners in different areas of the country — the weather can range from mild to severe, depending on where you live. 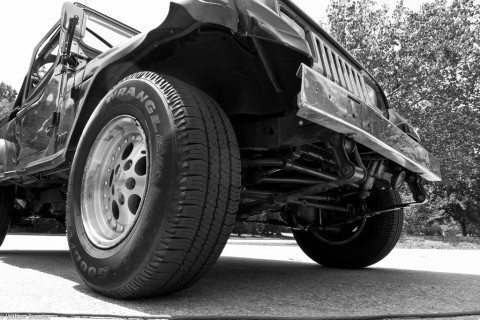 It’s important to do a thorough check of your Jeep’s external parts to ensure that they are in good working order. It can’t hurt to check the interior parts & accessories too. Living in the Pacific Northwest, I’ve found that I need to routinely replace the windshield wiper blades this time of the year. My friends who are Jeep owners and live in snowy areas of the country… they usually have to replace their rear plastic windows (due to bushwhacking in the snow) as an annual ritual. Even if you are in doubt — and it’s not cost-prohibitive to do so — replacing a minor part with a new one is a good practice at the start of each riding season. #4 – Spring into action. Once you’ve given your Jeep a thorough spring cleaning and a comprehensive overview, it’s time to start planning that inaugural ride to kick off this off-roading season. For me, that means riding at the Oregon Dunes National Recreation Area in nearby Reedsport, Oregon—one of my top off-roading destinations and a perennial favorite. I also find myself fantasizing about epic rides that are still on my Jeep bucket list this time of the year. For me (drum roll, please), that happens to be Hawaii’s Big Island, which — with its miles of jungle and beach trails — is supposed to be a mecca for Jeep enthusiasts. Whether you’re in Kona or Kentucky, a little spring cleaning for your Jeep now will go a long way in ensuring a safe and fun riding season ahead! What’s On Your Jeep Bucket List?